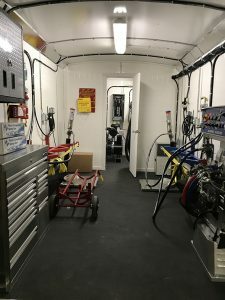 Selecting a spray foam rig requires care and accuracy. Plus, when you invest in the right equipment, you get to enjoy an efficient and durable trailer which improves your overall business productivity. In this post, you’ll learn how to choose the best spray foam rig for you. We carefully describe the vital steps you should pay attention to before buying your foam rigs. SprayWorks Equipment Group is proud to announce our new 20 foot Roofing Rig. This low-cost rig is a solution for large-scale projects requiring high-output plural component machines without a high-cost rig. At 20 feet, it becomes easy to transport to your job site. Many commercially designed rigs are longer and require heavier tongue weight. Maintaining your equipment seems like an obvious requirement, but keeping your rig up to snuff can seem tedious. Trust us, it’s not the most fun job, but it is a necessity to the life of your rig AND surprise surprise, your equipment too! In this article, our experts pulled together four of the most effective steps in maintaining your rig – aside from your standing oil changes, engine checks, and tire checks. Clasic GH-40 “Plus” proportioning unit! Only available while supplies last! It resembles a Mars Rover Robot, except that a spray gun is mounted on this motorized mobile spray machine. Introducing the latest innovation in spray coating equipment: The Spraybot, from Sprayworks Equipment Group. Jim Davidson, President of Sprayworks Equipment Group, LLC in Canton, Ohio has invented a new automated spray application machine that has been patented as the Spraybot. This roving machine is designed to evenly apply spray foam, polyurea, or other coating materials to roofs, bridges, decks, and other large horizontal surfaces. Interestingly enough, automated spray machines are finding a place in floor-coating industries that require the application of elastomers, polyureas, epoxy, and other types of coating materials. End of the Year Spray Foam Equipment Sale! Now is the time to save! If you’re looking to upgrade your existing spray foam machine and or looking to expand your spray foam business. Purchase a PMC GH-40 PN# GH 40P-1210A30 from SprayWorks Equipment Group for only $18,500.00 offer expires 12-31-13. PMC PH-25 Spray Foam Machine package from SprayWorks Equipment Group and receive……..
SprayWorks Equipment Group is well known for bringing quality products at affordable pricing to the spray foam industry, from mobile spray foam rigs, barrel blazer drum heaters, the SprayBot and PMC spray foam equipment, just to name a few. SprayWorks introduces a high performance Spray Foam Mechanic Overspray Release agent that is a clear spray-on silicone mold release and lubricant combined. SprayWorks Spray Foam Mechanic Overspray Release is designed specifically for use on spray foam insulation equipment, like lends covers, mask, spray guns, machines and hoses, making foam removal a snap. Spray Foam Mechanic Overspray Release is also a lubricant; lubricate internal and external components on and in your spray guns. 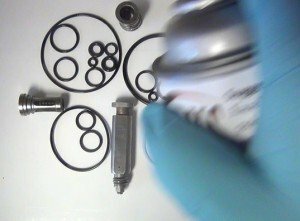 Use SprayWorks Spray Foam Mechanic Overspray Release when rebuilding spray foam equipment, pre lubricating piston shafts and seals before reassembly. Apply Spray Foam Mechanic Overspray Release to piston shafts before, during and after usage to further extend the life of seals. Another spray foam rig from SprayWorks Equipment Group exceeds customers expectations. We received our spray rig today, I must say Sprayworks not only met our expectations but surpassed them by a long shot. The attention to detail is phenomenal, the layout is all business and well thought out. I would definitely recommend sprayworks rigs to any company from established companies to new up incoming alike. The sales staff is great to deal with and knowledgeable.